The November issue of The RADIOGRAM has been published and is ready for you to enjoy. Click on the newsletter icon to your left, or click the NEWSLETTER tab on the PCARS web site and you can either view the newsletter on-line, or right click and “save-as”, then put it on your computer to view off-line. Hope you enjoy this issue – READ ALL ABOUT IT – SPECIAL MEETING IN NOVEMBER for the Center of Hope fund raising BE THERE– Elections will be at the November Meeting – Report on all of the work to fix up the Club Site – Reports on the CA & AZ QSO Parties – Veterans Day Special Event from the American Legion Amateur Radio Club – PC Boards are in for the Code Practice Oscillator – PCARS has a TON of stuff going on and even more in the works – something for everyone! Any mistakes found in the newsletter are there on purpose so some of you can can have fun finding them…. Following is a letter that I have been using via email to solicit my family and friends to help support the PCARS fund drive for the Center of Hope. Please feel to plagiarize, modify and use it in whatever way might work for you! As you know, I have been an Amateur Radio Operator for most of my life. The Amateur Radio Service, as defined by Federal Law, exists for many reasons, and one of those reasons is to provide “service” in both local and national events. Usually in the form of auxiliary communications. My local club, the Portage County Amateur Radio Service, Inc. (PCARS) has always been active in providing communications services wherever they are needed. I’m especially proud of my club for expanding our “service” into other areas of our local community. Most significantly our annual giving to the Center of Hope. The Center of Hope provides meals, groceries and other services to the less fortunate citizens of Portage County. Every year since its beginning (2006), PCARS has made a donation just prior to Thanksgiving to help support the Center of Hope’s mission. Over the past 12 years, we have raised and donated almost $30,000 to the Center of Hope. Our donation has increased every year so far, with last year’s donation just over $6400! I’m asking you for your help and support. Not for me, not for my club, but for the families who need help, especially as we move into the holiday season. Your donation of any amount would be greatly appreciated! There are 3 ways you can make a donation: 1) You can give your donation directly to me. I will make sure it is properly notated and included in the PCARS donation for 2018. 2) You can mail your donation to: PCARS 705 Oakwood St., Box 12 Ravenna, OH 44266. 3) You can go to the PCARS website www.portcars.org and in the upper righthand corner of the homepage is a PAYPAL button specifically for donations. Please add a comment with your name and address if you would like a donation receipt. All checks should be payable to “Center of Hope” and you will receive a receipt directly from them. 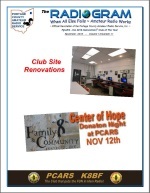 You can find more information on the Center of Hope at https://fcsserves.org/program/center-of-hope/ and you can find more information on PCARS and Amateur Radio at the PCARS website. Thank You! And please feel free to forward this to anyone else who might be interested in helping us make this years PCARS donation bigger than ever! The PCARS November newsletter (The RADIOGRAM) is coming out in just about a week. The last Friday of the month is this coming Friday – October 26th. I’m requesting you get your inputs for the newsletter to me as soon as possible. Dead line is Friday, Oct 26th at 8pm. As most of you know we are holding a silent auction for the club trailer. I have received a lot questions about the trailer so I thought I would send a QST with some pictures and a brief description. Bids over $300 will be accepted with the largest the winner. Bidding will be open until midnight October 25th. Proceeds will go to the Center of Hope. 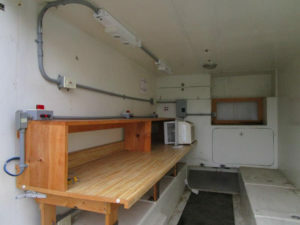 The trailer was constructed from a fiberglass Swiss Army Ambulance module. 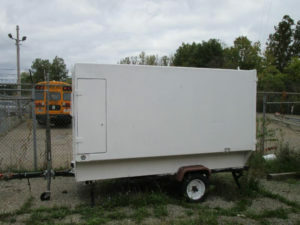 The module is mounted on a wood base which is mounted to a steel boat trailer. 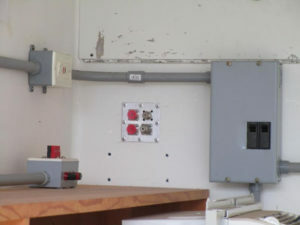 It has an equipment bench, an Anderson PowerPoll distribution system for DC power, a GFI protected AC power distribution system, a lighting system and an air conditioner. It has bulkhead connections for antennas and AC power. 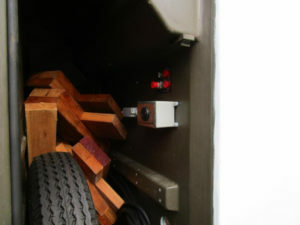 Also included are a good spare tire and cables to connect the trailer to AC power. The trailer does not require a title (under the gross weight requirement). Some additional pictures are attached. At $300+ this is a great deal for anyone that wants to operate from field sites. The trailer and all contents are being sold “AS IS”. Please send all bids to me at jawilson@j3solutions.com by October 25th. Only bids received by email or in writing will be accepted. These are all great prizes and worthy of a sizable donation. And there may be even more things on the list before the big event. So please plan to come to the meeting and support The Center of Hope.